Why Isn't Outlook's Junk Mail Filter Stopping More Spam? - Ask Leo! Why Isn’t Outlook’s Junk Mail Filter Stopping More Spam? Outlook is doing the best that it can with spam, but your expectations that it can block spam based on the From addresses is a tad off the mark. I’ve been puzzled about my Outlook 2007 junk filter for a long time now. The junk filter is set high and it seems to do a pretty good job of catching the majority of flagrant spam. What puzzles me is that there are certain senders that I’ve marked as junk, but email from these senders still somehow seems to find a way to evade the filter and come into my inbox anyway. Some of these are the flagrant kind but others are seemingly legitimate companies or individuals. What is strange is that I can even create rules to move items from these particular senders to the deleted folders, but the rules seem to have no power to do so. Are these senders doing something unethical or sneaky to get the past filters and their rules? One of the senders is using Constant Contact. Does this mean that they’re an unethical company? What’s really going on here? First, let me begin by saying Constant Contact is certainly an ethical company. The problem is that as an email service provider, the people that send email using them may or may not be. Companies like Constant Contact and my favorite, Aweber, will actually check to make sure that their users are being ethical or they’ll terminate their account. Unfortunately, there’s a window of time where the unethical users will continue to send spam before the company actually finds out. No, you’re right. What’s happening here is that the senders are in fact being sneaky. There are many different things that could be going on here, but I want to be clear about one thing. When you mark something as junk, you are not necessarily just saying, “This email sender is sending me junk.” You’re also not necessarily blocking the sender of that email. Instead, you’re telling your email program that this message “looks like” junk. As for your question, it’s a common misconception to suspect that email programs detect spam only by looking at the From address of the email. They don’t. When you mark something as junk, the From address is only one piece of information. As we’ll see in a minute, it’s actually a small piece of information that’s not very reliable. It then uses that to add to its knowledge of what you think is junk or spam. The problem here is that spammers have been spoofing From addresses for a really long time. They rarely send email from the same address twice. Heck, they rarely send spam from an address that they even own. They’ll say, “This message is from Mary Jones,” and have an email address for Frank Johnson when the name and the email address that display don’t relate to each other, and have absolutely nothing to do with the actual sender of the mail. Blocking or setting up rules for email addresses and having the spam filter focus on the From address are ineffective and inefficient ways of blocking spam. That’s why most spam filters now look at the content and other characteristics of the email rather than looking at the From line. Outlook is doing the best that it can with the spam that’s coming in, but your expectation that it will block things based on the sender address is probably off the mark. It’s not a technique that, by itself, works very well at all. How Do I Stop Outlook.com from Putting Legitimate Messages in the Junk Mail Folder? - Outlook.com, like most email services, tries hard to keep spam out of your inbox by placing it in a junk mail folder. Sometimes it gets a little too aggressive. I'll look at how to tame it. « Previous post: Does Opening Multiple Tabs Affect My Network Speed? vert good article. i wonder if there is a do not email– goverment place??????????? No “Do Not Email” list of any kind would be effective. Spammers simply don’t care about such lists — they aren’t even in “your country here”. In fact such a list would likely have the opposite effect as it would be a list of verified email addresses. I agree with that. In fact, your post made me remember back before internet when mail was used a lot more to reach people. I used to get tons more junk mail than I do now… and they had to actually pay for it. There’s probably no way to remove all junk and spam from our lives. Very interesting article about Spam mail. The comments here and others I’ve seen about Outlook make me wonder about something. I use Yahoo mail and have for about 15 years +/-. They seem to have a very good filtering system. I see very few bogus emails and seldom see a valid email in my Spam filter. I have found that almost all of the spam I have received through the years have been from hijacked email addresses. The messages are short, don’t contain any trigger words and include an URL to open. They usually contain 5 to 8 or more to addresses, usually in alphabetical order. People who receive these should not open them and should send them back to the address they were sent from, which is someone you know that had your address in their address book. Other than being a bother, IMO they are harmless and should just be deleted. My question is, other than changing you own email address frequently, Is there any way to stop these ? I wouldn’t recommend sending them back where they came from, as this just tells the spammers that your email address is valid. I mark them as Spam and hope that there’s enough information to teach the Yahoo Spam filter to recognize those kind of emails as Spam in the future. I believe Stuart was talking about sending it back to your friends when it’s obvious that there email has been hijacked. I’ve done that a couple of times when my cousins’ email addresses were hijacked. They thanked me for alerting them and got control back. Other than those situations, I just delete them. Marking them as spam (“This is spam” or “This is junk” button) will help train the spam filters. Other than that, no, not really. I seldom get unsolicited email that I’m interested in. I don’t run a business, so I don’t have strangers legitimately trying to email me. I created a filter in Firefox that marks all email that are not from someone in my address book as spam. So my inbox is usually pretty clean, unless a friend’s email address has been hijacked. Occasionally I check the Junk folder, but rarely see anything that I’m actually interested in, so the Junk just gets deleted. I use Spamfighter Pro. I can configure the filter, and blacklist by IP address which seems to be the most effective I think. Except that whenever I have to reboot my modem, I get a different IP address. I’m sure spammers have to reboot their systems, too. So blocking an IP address is only going to work until their IP address changes, which for most people happens from time to time, unless they pay extra for a static IP. Thanks for including that aweber is a legit company. I have a few consistent spammers that are over half of the total. I will be sending aweber a note with the ones that come via them. Are there other legit mail companies that we can watch for to forward the spam info to? As a legitimate company Aweber includes a link at the bottom of all emails sent from its system that will allow you to unsubscribe from the list. They have pretty good controls in place to prevent people from adding new names to the list without them being verified. So I first would spend my energy in unsubscribing. 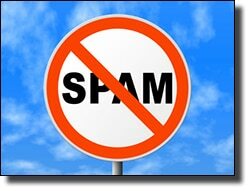 Remember that just because you don’t like it doesn’t mean that it’s spam. If the sender is following all internet protocol properly they are allowed to send newsletters to anyone who has subscribed to them. What they are not allowed to do is add your email back to the list after you’ve unsubscribed. That’s why each subscriber to the Ask Leo! newsletter has to manage their own account rather than emailing in and asking for an email address change. Another good company is Constant Contact. You will also get a link to unsubscribe from any email sent from their system.